Congratulations and thank you to our hardworking Trapper Team for an amazing job! With their help, we completed our Trapper Team Grant in 5 months! The San Antonio Area Foundation awarded SAFCC a grant to pay trappers to trap cats for elderly, disabled, apartment complexes, businesses and mobile home communities. Our Trapper Team consisted of 10 veteran trappers who trapped 1,000 cats that had no one else to trap and TNR them. It was so successful we will try for another grant this year to do the same! School may be out but local students have been working hard to help community cats! Third graders from Mrs LLewellyn's class at Oak Meadow Elementary held a County Fair where each child sold goods or services as a lesson in economics. Class earnings were combined and students decided to donate their $222 in earnings to SAFCC! Glen Oaks Elementary students were encouraged by their teacher to do a project to help community cats and they elected to do a food drive for SAFCC. Our volunteers picked up the donated food, which will be distributed to our feral colony caretakers, and each child received a paw-prints pencil as a thank you from SAFCC. Thanks as well to MacArthur High School students and faculty for donating to SAFCC as part of their annual Powder Puff game between senior and juniors. It's a long tradition to fundraise for a charity of their choice and our organization was the lucky recipient this year. We are so grateful to be selected!. Big thanks to these students and their teachers. Because of your generosity, we can continue to help our community cats so that they can have healthy and happy lives. SAFCC joined may other community and animal rescue organizations on April 22 at Woodlawn Lake Park for an Earth Day celebration. There was a great crowd at this annual event and SAFCC volunteers were able to reach out and talk to many in attendance about community cats. Those who stopped by our table also got free catnip seeds to plant! For the first time ever, SAFCC sold Fiesta medals to celebrate the city's annual festival. Medals were sold at various events throughout the city during the weeks of Fiesta celebration. This will be an annual fundraiser for us and we welcome ideas for our 2018 medal! Didn't get to buy a medal? We have a handful of medals left so get yours right now! Please email HERE to inquire. Thank you to everyone that purchased some SAFCC fiesta bling and for representing community cats! This fundraiser was also tied to a Community Cat Podcast grant where we will receive $1,000 as part of a matching grant! Last week, SAFFC received an urgent call on the helpline. The frantic voice on the other end stated that someone needed to come and pick up a box of 5 kittens right away from a salvage yard. The kittens had arrived undetected in the back seat of a car that had been towed to the wrecker yard. The tow driver had seen a large cat jump out of the vehicle as the towing started but thought nothing of it. When the car arrived at the salvage yard and got inventoried, a box of kittens was discovered in the back seat. The kittens were 4 weeks old. The woman stated that if the kittens were not picked up the next morning, the guys in the wrecker yard would most likely throw the whole box of kittens into the auto crushing machine. The kittens were rescued and are now being fostered by SAFCC and will soon be looking for their forever homes! We get calls like this every day. Pease consider volunteering, fostering or donating to help us help more kittens like this! Celebrating a Birthday? Having a lunch meeting? Or just need to re-fuel while shopping.... 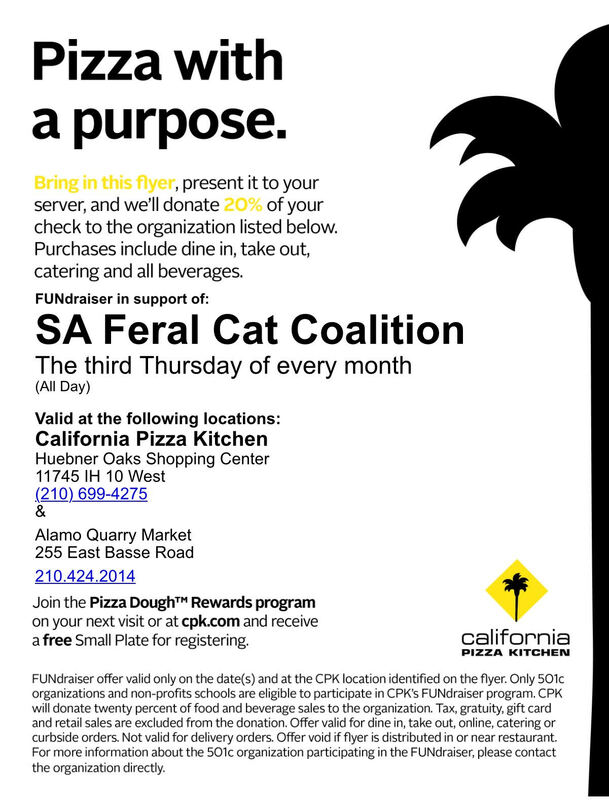 Present this FLYER when you dine in or take-out on June 15 and 20% of your bill will be donated to SAFCC.